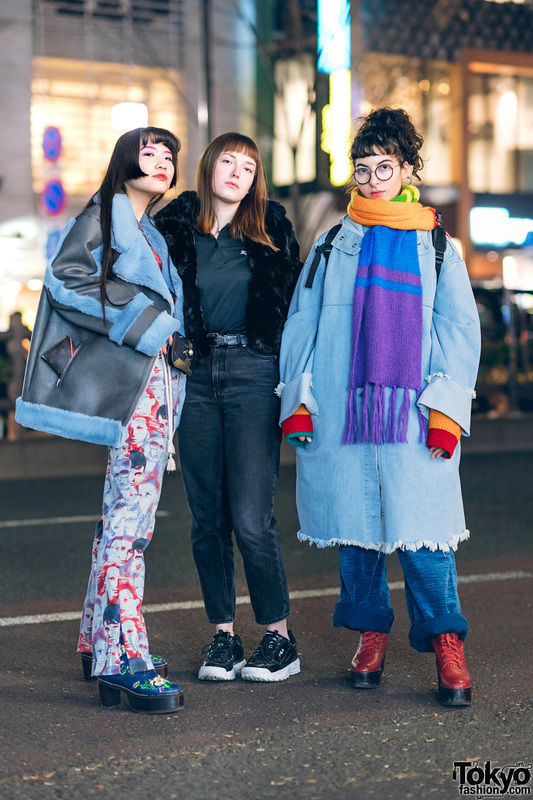 Catching our attention on the Harajuku neighborhood one evening are Kana, Lea and Lina, a trio of girls wearing eye-catching streetwear ensembles. 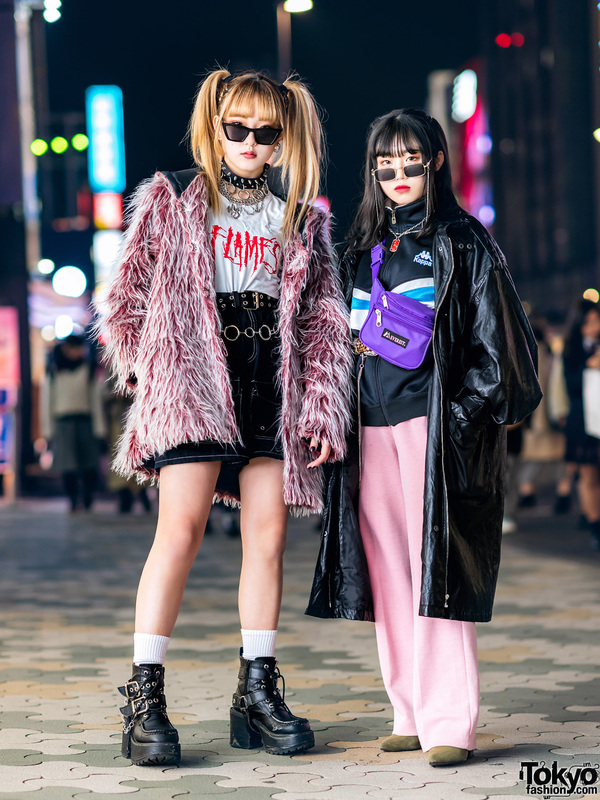 At the left is Lea, an 18-year-old bartender in an all black outfit. She is dressed in a vintage black furry jacket, a black Burberry collared shirt tucked into black cropped denim pants, which she bought at Monkey in Hong Kong. Black patent leather sneakers from Fila, and a vintage Daniel Wellington black leather belt finished off Lea’s style. Gucci is Lea’s favorite fashion brand, and she enjoys the music of American rock trio, Highly Suspect. Follow Lea on Instagram. 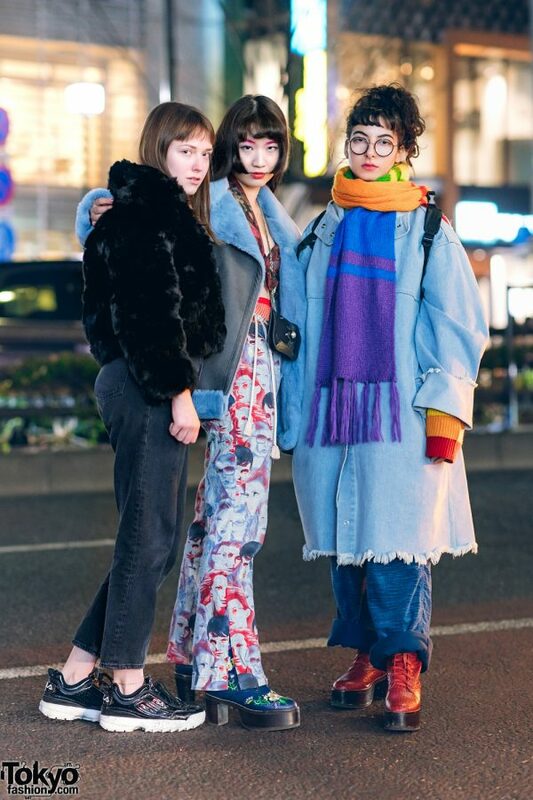 At the middle is Kana, a 21-year-old Giorgio Armani staffer. 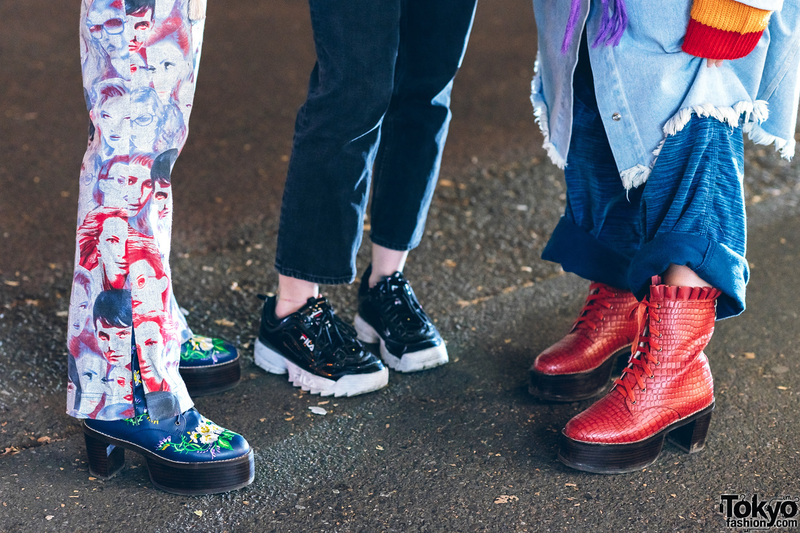 Her outfit consists of a grey faux leather jacket with blue shearling trims from Heurueh, a floral print cropped top from Otoe, red fishnet tights and graphic print pants with side slits from Barrack Room. She completed her outfit with a pair of dark blue heeled lace-up boots with floral prints from Murral, a gold chain necklace from Otoe, and a vintage handmade waist bag. 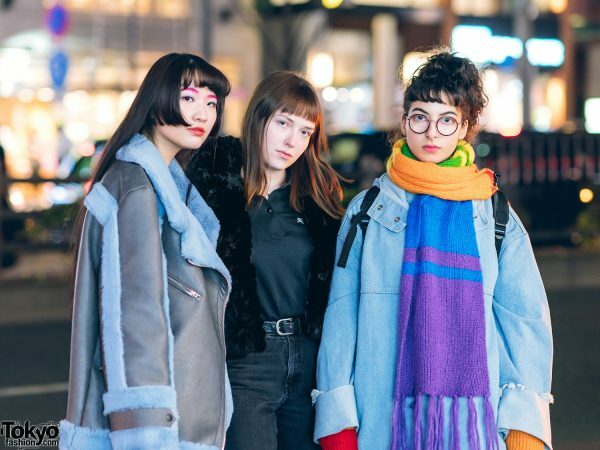 Kana lists Murral, Gucci, Ryota Murakami and Mikio Sakabe as her fashion favorites, and she likes the music of Sum41, Piano Guys and Katy Perry. 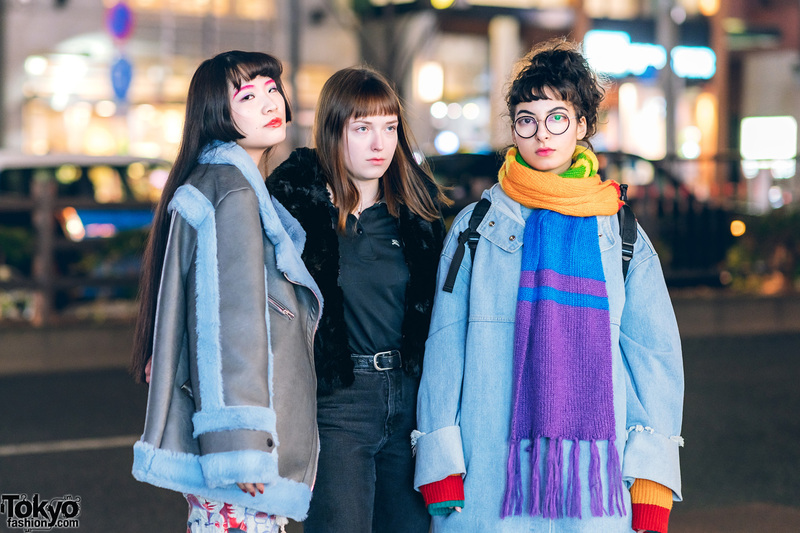 For her social media updates, follow Kana on Instagram. Meanwhile, Lina is wearing a resale Second Street denim coat with a fringed hem and cuffed sleeves. 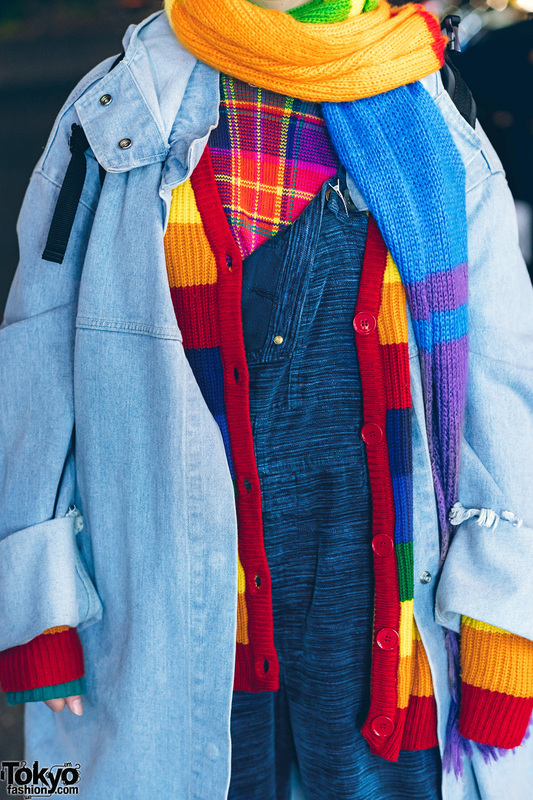 The 22-year-old English teacher styled her denim coat with a rainbow knit cardigan and a plaid knit sweater from Ralph Lauren. 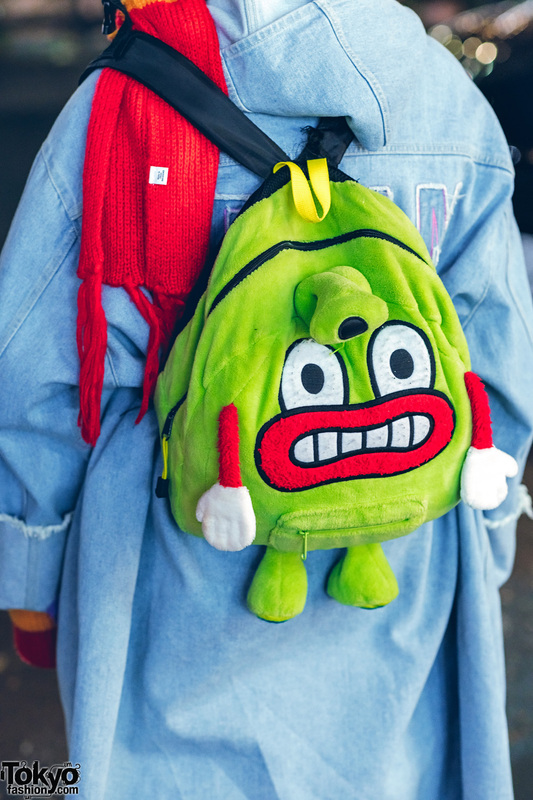 Resale overalls from Second Street, red crocodile leather lace-up boots with ruffles from Murral, a fast fashion knit scarf with fringes, and a green Monster backpack, also resale from Second Street, rounded out her streetwear style. Lina’s favorite fashion brand is Comme des Garcons, and she listens to 80’s rock music. Lina is also active on Instagram.